How do you write a review of a DVD set that spans 40 years in the life of the filmmaker? This is perhaps as puzzling as the work of Lawrence Jordan itself. 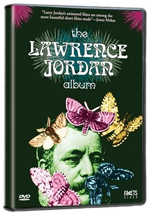 If only my review were as fascinating as the films shown in The Lawrence Jordan Album, the new four-disc set from Facets.... Give me another 40 years to work on it. Jordan’s work can be pigeonholed with a one-word description: animation. We can then tighten down the definition further by saying it looks like the animation of Monty Python’s Terry Gilliam. Yet for something that is so much like Gilliam’s work, it is so unlike it. Both artists use flat cutouts of 19th century images that are laboriously hand animated in stop motion. Where Gilliam used his imagery as comedic camp artifice, Jordan has bought into the nostalgic sentimentality of the engravings that he used. Also, Jordan got there first. I got the sense that Jordan’s animation is coming from the pre-mainstream hippy San Francisco aesthetic of the mid-60’s. This was the high-underground romantic style of the Pre-Raphaelites and Art Nouveau, so different from the hard-edged Atomic Modernism of the time. For instance, Jordan has given over one whole film to 19th Century artist Gustave Doré’s steel engraved illustrations for The Rhyme of the Ancient Mariner. Narrated by Orson Welles, this interpretation of Coleridge’s poem is one of the high points of the set. Jordan was also careful with his soundtracks and often turns to the music of Eric Satie. This is, I think, a perfect match. Satie is both lyrical and spare which matches Jordan’s animations. And the fact that Satie was composing at the height of Art Nouveau doesn’t hurt either. I’m surprised that there wasn’t any Mahler in the mix. Now for the bad news. Most of Jordan’s work in this set is not for everyone. In fact his work may be the antithesis of modern sensibility, and will probably baffle and annoy the modern audience (maybe that is to his credit). You could say that the signal to noise ratio is very low. This is not work that you can skim over or fast forward through. Watching (or as we used to say, “experiencing”) the film is the point of the exercise. A large part of that experience is the length of some of the animations. Sophie’s Place is an epic 86 minutes long. In addition to what might be called “classic” Jordan, this set also includes some of his non-animation work. In a category by itself is his Sacred Art of Tibet, which is unlike anything I’ve ever seen before. It’s what I’d call “sort-of-animation” and is my favorite of all the works on the DVD set. Then there are the straight-up films. Visions of a City was shot in 1957 but not edited until 1979. The hook is that it’s a cityscape shot through reflections of windows and car chrome. I think Jordan was on to something here; it’s too bad he didn’t follow up on it some more. Winter Light was shot in 1983 on a foggy morning somewhere in the Bay Area (I’m guessing). It’s nice cinematography, but is it good filmmaking? Like Oakland, there’s no there there. The rest of the shorts look like “film I shot in my garden” and “film I shot on my trip to Spain and Greece.” If there’s something to get, I don’t get it, but I’m willing to accept that the problem is mine. This set is an important source for the student of film — particularly independent American film — but I can’t say that I’d recommend it for an evening’s entertainment. Nevertheless, I’m glad it exists on DVD. The notes included with the set are a must-read. I recommend you read them before you watch the films, although during and after might also be helpful. Picture and sound are acceptable. Jordan prefers 16mm film, so it’s all got that look. Because Satie is such delicate music, the sound needs to be clear, and it is. Read the notes, take a deep breath, and don’t try to mentally hurry the films along. Mr. Jordan is driving this bus.